EXCLUSIVELY AT NEIMAN MARCUS Sham made of silk. Dry clean. Twisted corded edge. 20" x 36". Made in the USA of imported materials. 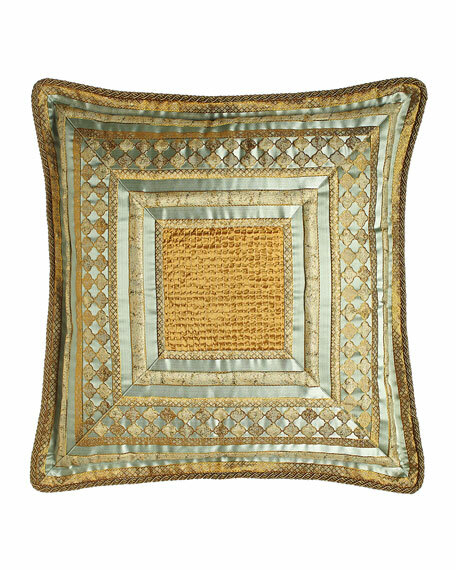 EXCLUSIVELY AT NEIMAN MARCUS Embroidered sham with brush fringe. Zip closure. Front: polyester. Back: cotton/polyester. Dry clean. 25"Sq. Made in the USA of imported materials. EXCLUSIVELY AT NEIMAN MARCUS Botanical leaf jacquard sham. 1" solid mitered flange. Silk/polyester/acrylic/cotton. Dry clean. 26"Sq. Made in the USA of imported materials.